My best dressed of the night. His suit jacket is perfection. Her dress is so dreamy. They look like an adorable couple...even though they are SO not a couple. Fall TV is upon us! And, why? Because the 2016 Emmy Awards were last night. And let the people rejoice. Jimmy Kimmel, who hosted the award show in 2012, was back this year. I think he did an extremely good job. Not a dull or awkward moment for him on that stage. Well, there was one quote-on-quote awkward moment involving Bill Cosby being present at the show. Took the audience a while to get it but I immediately laughed because it was hilar. Also, him blasting Maggie Smith for treating the Emmys like trash made me chuckle. Congratulations to so many of my favorites who were handed a statuette or two...: Game of Thrones, The People v. O.J. Simpson, Regina King (She deserves all of the Emmys for her work on American Crime. 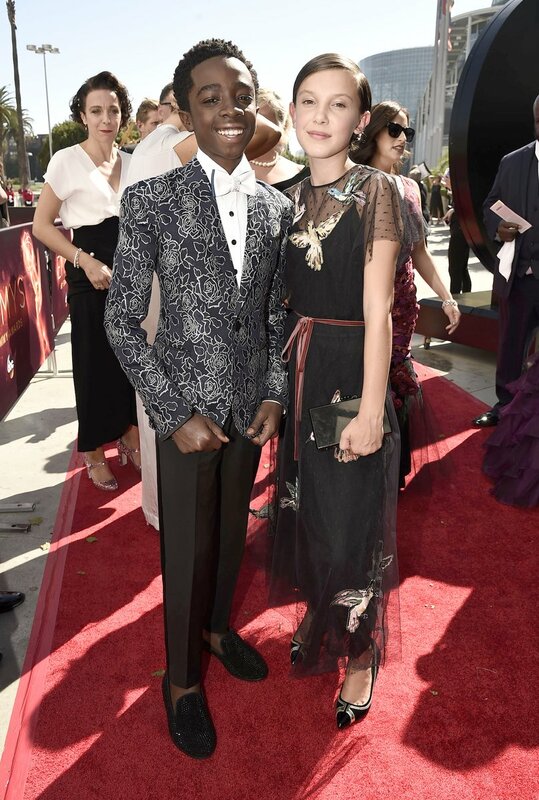 However, I'm telling you, the Academy is making up for their mistake of not honoring her during the SouthLAnd days), Sarah Paulson, Sterling K. Brown (His acceptance speech was my favorite of the night. Also, thank him for reciting the 'I got the hottest chick in the game wearing my chain' line and then afterwards at least 3 other male winners quoted the line, too. Also, here I was thinking the lyric was well known but it went over a lot of the audience and media's head. Seriously, even the Hollywood Reporter created an article and tweeted about line finally being explained. D'oh. ), Courtney B. Vance, Veep, Julia Louis-Dreyfus, Rami Malek, and Tatiana Maslany. I commented on how her dress is an Emmy winning dress. Sarah knew she was going to win. And this dress proved it. This retro look and styling works like a charm for Kirsten. She has stepped up her red carpet game tremendously. But that hair. That hair. It's like two steps forward, one step back. Laverne needs a hair intervention. Very pretty dress that called for a contrasting color in accessories. Because I don't mind the matching lipstick. But the matching clutch is a step too far in pink. The shape and design of the dress fits her remarkably well. The color and print, I'm not a fan of. I feel like I've seen her in this dress before. The same with this dress. Granted, both Tracee and Niecy look nice in white. But both of their dresses got a 'meh' from me. Tracee's look would've worked better with a more dramatic hairstyle. Lovelovelove her hair. OMWord, me want. Her dress is okay. Didn't wow me like it wowed so many others online. I will say she did bring something new to the red carpet maternity wear scene, that's for sure. Two great items in beautiful colors. Not meant to be paired together. I understand what she was trying to do - mix edgy with feminine. She was trying to be different but totally missed the mark. The side panels on the top looks limp as hell. Making the whole look come off as sad. The color is so blah. Especially against her skin. This dress with cape would work better in a more vibrant gem color. No to the flat iron bangs. On the bright side, her and her husband's restaurant, RPM Italian, is really nice. Went for a family dinner to celebrate my Mom's birthday. 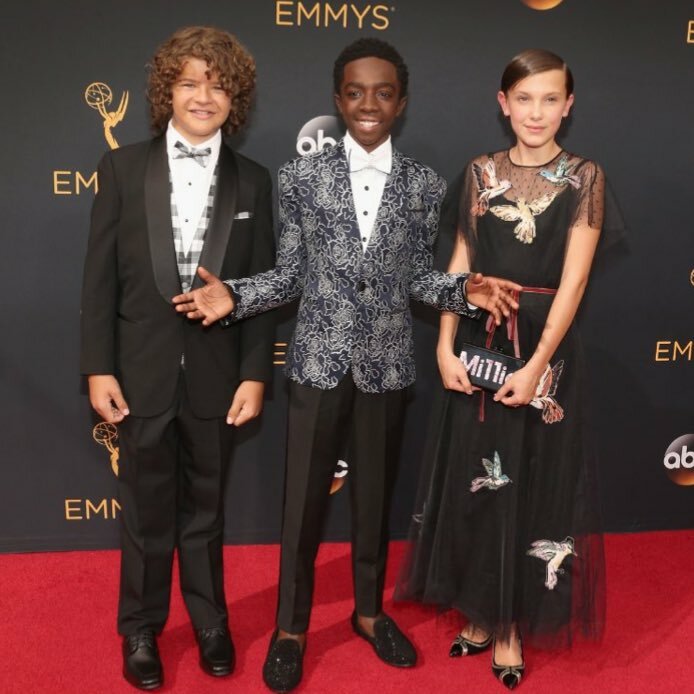 And one more time for the Stranger Things kids. Adorable! Okay, sis. I'm gonna watch the show. These kids have convinced me. Did you watch the 2016 Emmy Awards? Who was your best dressed of the night? Which new show are you excited to watch this Fall? I'm excited to watch This is Us.